Throughout the month of September, cafes and restaurants at Beachwalk join forces to bring a culinary festival, designed to celebrate the fantastic diversity of eateries at this popular retail & lifestyle hub, from hawker-style food, authentic dishes, international gourmet cuisines to clever fusion creations. Customers will be welcomed by various festive promotions and great meal deals especially presented to delight both I-know-what-I-want diners and the gastronomic adventurists. Series of culinary activities are hosted involving Beachwalk’s customers, tenants, Bali Best Chefs and media partners with highlights on 19-22 September where Beachwalk will feature Food Academy (culinary demo & workshops), Wine Tasting, Coffee Tasting, Chef’s Recommendation (signature dishes presentation & review) and Beachwalk Masterchef (customer cooking competition) judged by familiar faces from culinary experts in Bali. For a whole family foodie day-out, don’t miss Cupcake Frenzy (cupcake decorating & games), Beachwalk Food Bazaar (food stalls, sampling, regional produce) and I Scream for Ice Cream (Ice Cream Party), all at Beachwalk in September. Follow as many events as possible during this delicious month and make it your own gourmet safari experience. Full list of events is available at www.beachwalkbali.com or Beachwalk Bali facebook fanpage. 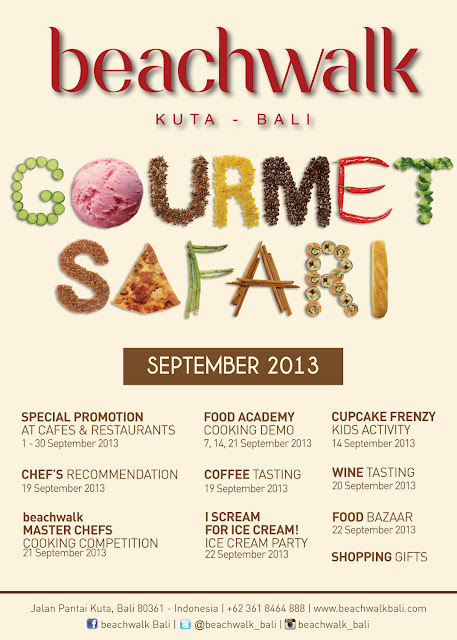 Beachwalk GOURMET SAFARI is supported by : Bali Best Chefs, Sababay Winery, Bali Deli, Dirt Java, Dessert Factory, Tapeo Gastrobar, Tony Roma’s, Nanny’s Pavillon, Café Sardinia, Kitchenette, Luna Negra, Sheraton Bali Kuta Resort, HARRIS Resort Kuta Beach and HARRIS Riverview Kuta - Bali. Beachwalk was built to complement the brand new five-star Sheraton Bali Kuta Resort and the existing four-star HARRIS Resort Kuta Beach, all in one complex of Sahid Kuta Lifestyle Resort, located at the very heart and soul of Kuta, Bali’s pioneer and most popular tourist destination. The mall covers 3.7 hectares of the complex’ 5.2 hectares of land which stretches for 250 metres along Jalan Pantai Kuta, overlooking the Indian Ocean.